When it came to my cake, this is what I had in mind. 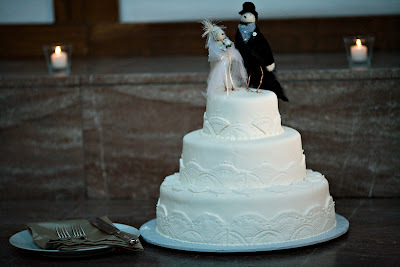 In order to achieve this look, I purchased a mold from Decorate the Cake and brought it to my baker. She seemed pretty confident that she could pull it off. She even tested a bit while I waited to see how it would turn out. She planned to use the mold to create the design on each layer by removing sections. Hopefully, this would create a new design on each layer. It didn't turn out exactly as I was hoping. The layers were quite thick, far from the delicate lace I was hoping for. I didn't actually realize how poorly this was executed until just this moment, comparing the photos. 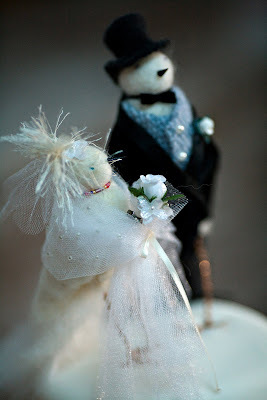 My cake was absolutely saved by my cake topper. How sweet are those little birds? My aunt made them from her handmade alpaca wool, using alpacas from another Aunt and Uncle's farm. She made the hat, just in case you were wondering. All the little pieces were borrowed from other super crafty projects that she had going on around the house. My uncle created the legs out of a strong metal wire, allowing them to nestle perfectly in the top of my cake. They were made with so much care and love, how could they not fix my sad and saggy cake? 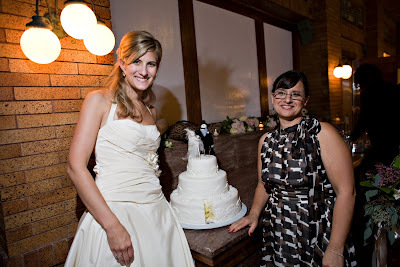 I do want to mention that the cake was delicious, even if the design did not live up to Martha's standards. It was very soft and perfectly sweet. the toppers are adorable! your cake looks great. but i know what you mean. my cake was definitely the downside to my day. i actually wanted to use the whole lace design from my MIL's hankie that we used on the STD, invitation, and program. 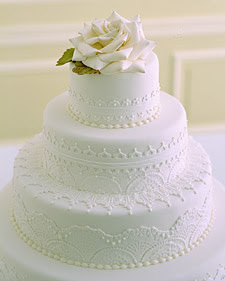 i had a MOLD MADE to match the lace and our baker still couldn't pull it off. i just had her make a smoothe cake in the end because i was so worried about what it would look like.